This simple recipe for oven-roasted potatoes makes a great side dish for so many meals. 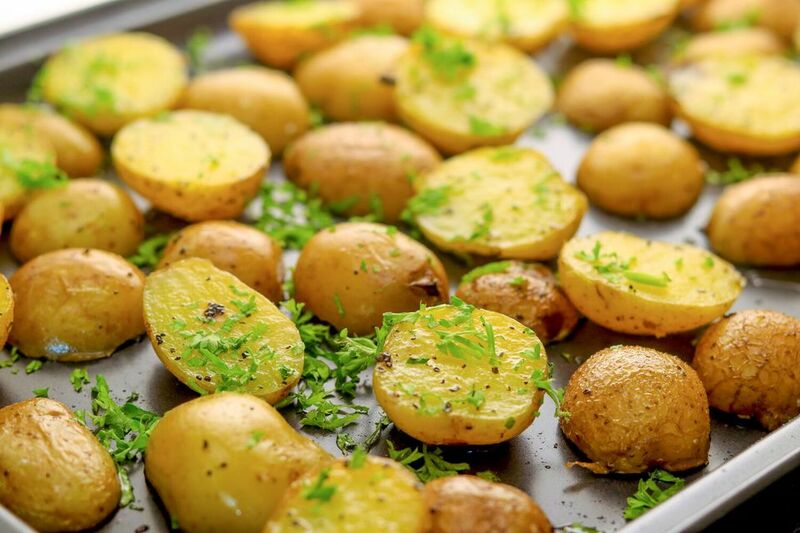 Using a pound of baby potatoes or new potatoes, olive oil, salt and pepper, the potatoes take just a few minutes to prep before roasting. If you have a gourmet salt blend or a fine quality olive oil, this is a great recipe to use them in. Simmer just until soft, about 8 to 10 minutes; then drain and cool immediately, and set aside. Place potatoes, cut-side down, on a non-stick baking pan and roast in the oven for 15 to 20 minutes, or until golden brown and crispy. Baby potatoes and new potatoes are similar, but not exactly the same. Some people call any small potato a new potato, but new potatoes differ from baby potatoes in that they have been freshly dug up and brought to the grocery store without curing. Most potatoes you buy in a store have been stored for a couple weeks, during which they are cured to set the peel and heal any cuts or nicks in the skin, which makes the potatoes last longer. Because new potatoes skip this step, they are usually more moist and sweeter than other small potatoes. Not all olive oil is created equal. Some olive oils are diluted with soybean oil, which lowers the quality and the potential health benefits in olive oil. To ensure you're purchasing a high-quality oil, look for third-party certification when purchasing.